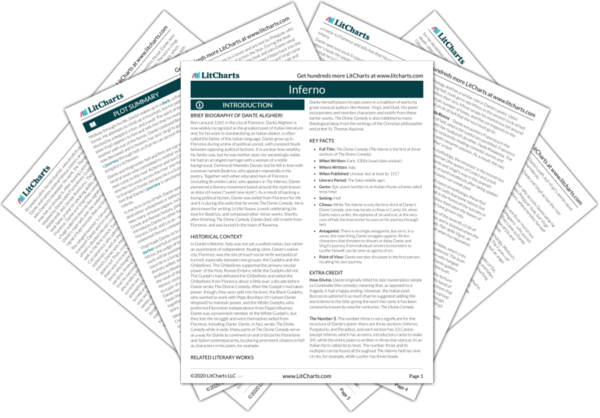 Instant downloads of all 946 LitChart PDFs (including Inferno). 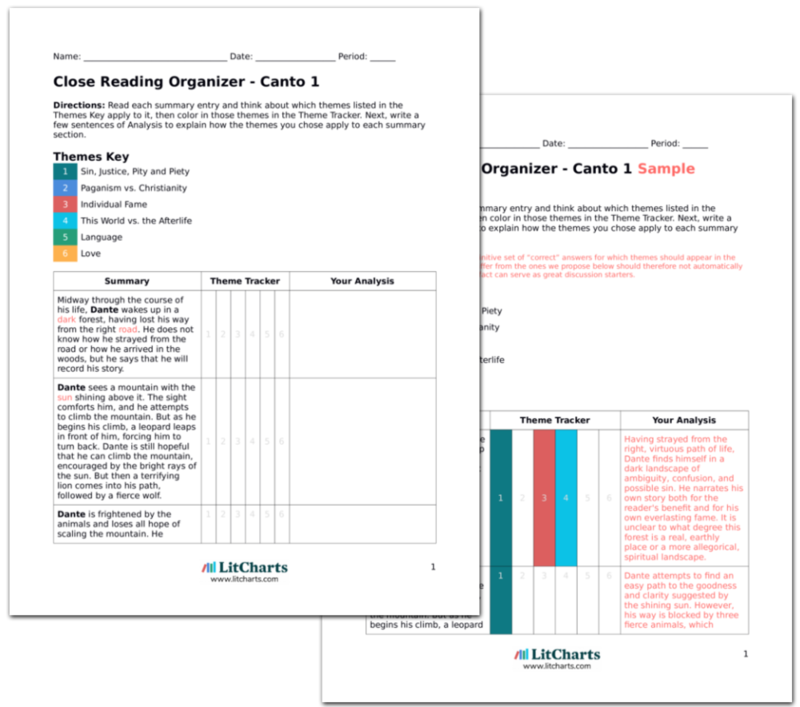 LitCharts assigns a color and icon to each theme in Inferno, which you can use to track the themes throughout the work. As Dante and Virgil continue along the river, Dante can start to hear the waterfall where the river drops off into the circle below. Three souls see Dante and recognize him as a fellow Florentine. They run up to him and Dante is horrified by their burns and scars, but Virgil tells him to listen to them. The three Florentines are eager to speak to someone from their own city. Even in the afterlife they (and Dante) feel a very significant attachment to their local home on earth. Dante stops and the three Florentines form a circle, so that that they can keep moving around while talking to him. They introduce themselves as three famous, noble Florentines: Guido Guerra, Tegghiaio Aldobrandi, and Jacopo Rusticucci. Dante tells them that he hesitated to speak with them not out of scorn but out of grief at seeing such noble men being punished here. He tells them that he is indeed from Florence and that he is being guided through hell so that he can eventually "seek the sweet fruit promised by my sure guide" (16.62)—that is, ascend to heaven. Even though these souls are justly punished by God, Dante is upset at seeing such noblemen suffering so harshly. Dante's conversation with them allows them to further guarantee their earthly fame by being included in Dante's poem. Jacopo wishes for Dante to have a long life and to live on in fame after his death. He asks how Florence is now faring, because he has heard from another Florentine who recently joined the band of Sodomites that the city is not doing well. Dante answers by proclaiming aloud that Florence is suffering from excess and pride in its citizens. The three Florentines praise Dante for his power of speech and ask him to speak of them when he returns to earth. They run off through the burning desert sands, letting Dante and Virgil resume their path. Jacopo encourages Dante to seek immortality through fame. While Dante does seek fame, he also seeks a truer form of immortality—salvation in heaven. The Florentines, unable to see the present clearly, are greatly concerned with the status of Florence. And note that Dante, also concerned for Florence, takes a swipe at those who now run Florence, who are the same people that exiled him. The three noble Florentine's praise for Dante's skilled speech shows that Dante is growing over the course of his journey, learning from the eloquent example of Virgil. Dante and Virgil arrive at the waterfall where the Phlegethon falls down into the eighth circle. Dante compares the huge waterfall to a waterfall in the Appenine mountains of Italy. Dante is at this point wearing a rope as a belt and Virgil takes it and throws it over the precipice of the waterfall. Dante thinks that something will come from this signal, and Virgil, as if reading his mind, says that the thing he seeks will indeed come quickly. Dante warns his readers that what he is about to describe will seem unbelievable, but he implores them to believe that he saw a strange shape rise from the waterfall, which he compares to a diver who goes underwater to loosen a stuck anchor. Here Dante stresses the strangeness of his marvelous experience, worrying that his words will seem unbelievable. At the same time, the only way he can try to communicate his experience is by likening it to something his readers have seen on earth: thus he compares the Phlegethon's massive waterfall to a waterfall in an Italian mountain range. Dante's afterlife is constantly in tension between being utterly different from and eerily similar to our world. 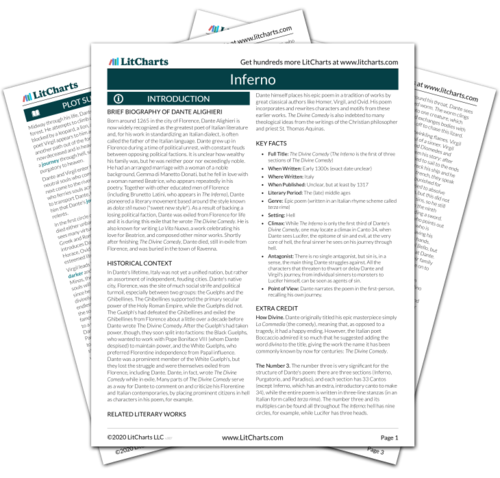 Get the entire Inferno LitChart as a printable PDF. Fredericksen, Erik. "Inferno Canto 16." LitCharts. LitCharts LLC, 20 Nov 2013. Web. 24 Apr 2019. Fredericksen, Erik. "Inferno Canto 16." LitCharts LLC, November 20, 2013. Retrieved April 24, 2019. https://www.litcharts.com/lit/inferno/canto-16.